I'm interested in this Small Town by Duong Ngoc Son. Please advise availability and price. Thank you. Duong Ngoc Son was born in 1973 in Ha Tay and graduated in 1997 from the Fine Art University in Ho Chi Minh City. 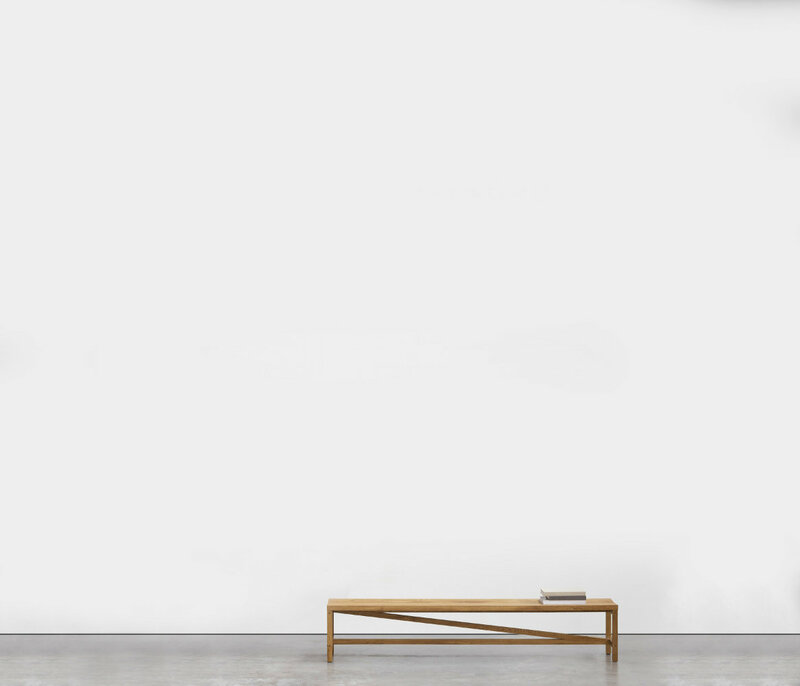 With exhibitions in France, Singapore, Malaysia and Zurich, his works are collected by the Ho Chi Minh Fine Arts Museum and private collections in Japan, Australia, Canada, USA, France, Hong Kong, Malaysia, and Singapore. Ngoc Son's pieces hum with an insatiable energy that lures audiences into his paintings with their captivating rhythm. His works reveal Impressionistic influences, mixing careful strokes with delicate colours. He employs warm hues to breathe life into the staple rice fields of Vietnam and the simple joy of Vietnamese villages. His brush strokes are playful and optimistic, imbuing his works with a friendly charm that is enticingly romantic. Although following impressionism, Duong Ngoc Son has made his paintings different from other impressionistic paintings with women in ba ba (Vietnamese traditional costume) or in white ao dai (Vietnamese traditional dress), which are reminiscent of Vietnam, his homeland. Artist Duong Ngoc Son: The Plant "Eater"
With a passion for oil painting, artist Duong Ngoc Son has continuously sought and expressed his emotions onto the toile. At first he focused on still life. With a subtle, skillful painting style and exclusive way of selecting and using colors, he searched for and expressed his own stories and states when facing simple things like a conical palm hat, a pomelo, a mangosteen, a bamboo bed, a smooth folded satin strip, pure lotus flower, or an old pottery vase. However, his still-life paintings almost have full of inanimate objects as though they would appear from the paintings. The background is often dark brown but it seems to echo through the thin layers of colors. Perhaps these are hidden signs for later changes in Duong Ngoc Son's paintings. In fact, from realism and the passion for the appearance and tranquility of objects, he suddenly shifts to the love of expressing his impressions upon colorful nature. It is like a man who wants to reveal his mind after being devoted to his own introspection. 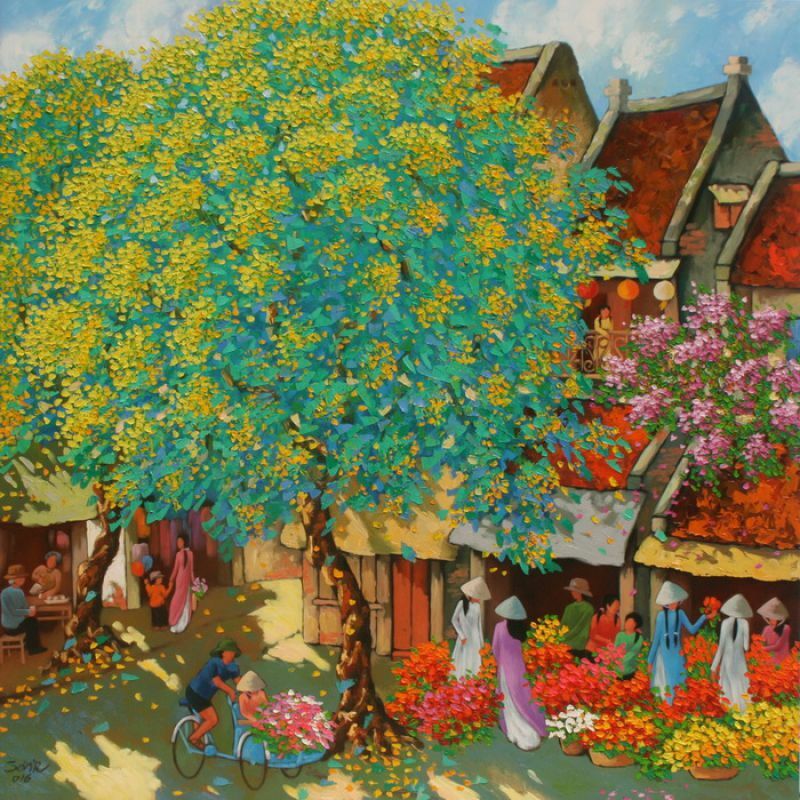 As regards Impressionism, it is noteworthy that all Duong Ngoc Son's paintings have plants. In other words, plants are the main character in his paintings. Plants are brilliant and cover most of the paintings, with such hot colors as bright red, orange, yellow and pink. He manages to express the eagerness and boisterousness of flowers and leaves in the sun and the wind with strong and rhythmic painting style. Not depicting flowers and leaves in detail as he did formerly, now he expresses his views about the life of flowers and leaves through bright colors and thick brushwork on the toile. Looking at his paintings and you have the feeling of standing in front of dishes of flowers and leaves. It is very impressive at first sight, but it will make you tired later because you have to breathe the same way as the brilliant flowers and leaves in his paintings do. Then you realize that the artist is falling in love with flowers and leaves! His menu is not like others' menus, and vice versa. Not many people can "eat" and "like to eat" flowers and leaves like he does. And this is probably the reason why Duong Ngoc Son has created his own painting style. Although following impressionism, Duong Ngoc Son has made his paintings different from other impressionistic paintings with women in ba ba (Vietnamese traditional costume) or in white ao dai (Vietnamese traditional dress), which are typical of Vietnam, his homeland. There is another interesting thing in his paintings: the transition of the position of objects and the still and animated states of things and people in Duong Ngoc Son's paintings. Looming under the shade of trees full of flowers and leaves are women, the still objects of the paintings though they are in action: rowing a boat, carrying things or riding a bicycle. In fact, all human activities seem to become still in front of natural flowers and leaves. A falling leaf seems to be heavy as though it would fall out of the toile. While many in the artistic circle try to make their own styles, Duong Ngoc Son's style was probably formed from his sincere, strong and exclusive love and view of the nature. He expresses his love and view innocently, and improves his oil painting skill continuously so as to be able to reveal his feelings and thoughts in his paintings. People often say that one should paint this way or that way to reach a subtle, smart and sizable rank. Duong Ngoc Son does not care about this. And this has formed his own rank, which represents what he really feels. As a result, viewers of his paintings are those who actually love his paintings and can share his feelings instead of buying a trademark work. The concept of ranking sometimes hinders the soaring of the soul of a real artist. Duong Ngoc Son's paintings clearly reflect their owner, who is simple and honest but determined, open and innocent but profound. For him, flowers, leaves and grass are not graceful and charming but hot, bustling and noisy. Similarly, Duong Ngoc Son has dedicated himself to painting consciously in his unconsciousness. Nature has always been an inspiring theme for Oriental or Western artists in either the ancient or modern age and a binding concern of artists, as is the case with Duong Ngoc Son. He was born and grew up in Vietnam where the nature is plentiful, with rivers, mountains and natural produce nurturing his soul. He graduated from the Fine Arts University of Ho Chi Minh City in 1997 at the age of 24. Upon graduation, he started to paint and kept learning from real life and nature. Thanks to his unlimited passion to art, he has spent all of his time painting tirelessly. So far, the total number of his paintings has reached 500 units admirably. His paintings are known by audiences all over the world and have been presented in local and overseas galleries or exhibitions under the form of collections. His main theme is nature. Nature is found in the streets and emphasised with a primary colour palette of pink and purple. His paintings are recognized easily through canopies of bright red flowers in summer sunlight or a clump of purple flowers that are flamboyant and vivid in the breeze of early fall wind. There are mossy gates and tiled roofs in his paintings, the facade of an old town visited by beautiful ladies in pure and white tunics ("ao dai") as well as many flower shops displaying an the bustling lifestyle of the cities. His most impressive paintings are showcase nature in the countryside. These paintings reveal his soul in blue and green which is represented by vast green rice fields. There are many cottages and villages behind a rampart of bamboo and pathways or waterways which compose lively and poetic scenery of the country life. The theme of nature is also expressed through the depiction of lotus ponds during blooming season. It is not limited to a doorframe but extended to an open space of sky where lotus is blooming. Thanks to his skilful composition in meandering brushstrokes, the surface of water becomes translucent and ethereal. Both the blue of water and the white of clouds reflected on the water make the green of lotus leaves lively but dreamy. These are among the most successful paintings by Son where he tries to represent the beauty of his country's nature on canvas. Truly, Son has properly utilised dimensions. His nature paintings are different from others as he can represent crowded streets without the impression that they are cramped and immense pastoral scenery without diluting it's vastness. Working individuals are also subjects of his brushwork, and are emphasised profoundly and delicately. His strokes are strong and fluid, and his vivid colour palette guides modern audiences towards a love of nature.